THE NHS has launched its national breast screening programme to invite GP registered women to come to routine breast screening sessions. This means that women between 50-70 will receive a mammogram to check for early signs of breast cancer. 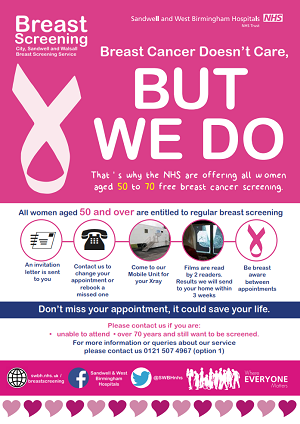 Women aged 50 to 70 are invited for breast screening every three years. There is also a randomised trial for ladies 47-50 and 70-73 to be invited. The programme aims to save lives by detecting the early signs of breast cancer when they are too small to see or feel. Screening saves about one life from breast cancer for every 200 women who are screened. This adds up to about 1,300 lives saved from breast cancer each year in the UK. Mrs June Bryan (69, from Sheldon, Birmingham), who survived breast cancer by taking her routine screening, talked about her experience: “I received a letter from the Breast Screening Unit to attend a routine screening in the X-ray mobile van in Small Heath. After a week, I received a follow up letter asking me to come back for further tests. I then had two biopsy tests and was confirmed to have DCIS (Ductal Carcinoma in situ) – the earliest form of cancer. The team had discussed with me and my husband the best treatment that I should have, which was to have a mastectomy (removal of the whole breast). The consultant and nurses made sure that I was fully informed and gave me the best attention when I was under their care.